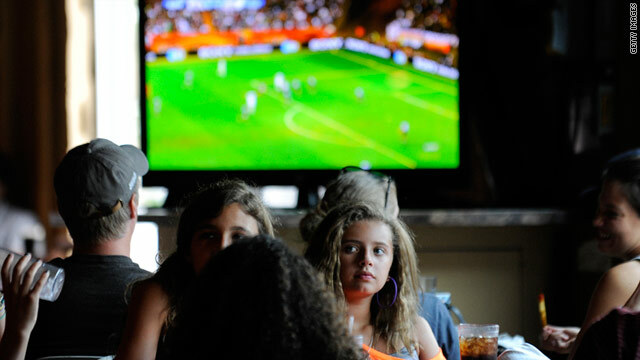 Fans in Silver Spring, Maryland, watch the World Cup final Sunday. Nearby Baltimore was the game's No. 1 market, ESPN says. The women’s World Cup final between the USA and Japan on Sunday pulled in some big numbers on the small screen. The game also was the sixth-most watched cable telecast this year, ESPN said. While Japan deservedly basks in the glow of championship and the U.S. women dig in for some well-earned rest, the ball continues to roll: School-age girls, inspired by Team USA, have taken up the sport in at least one urban soccer club. The Web also got in on the action. The World Cup set two Twitter records, both for number of tweets sent per second. Baltimore was the game's No. 1 TV market, with a 12.3 rating, according to ESPN. San Diego (11.8), West Palm Beach (11.7), Washington (11.5), and Norfolk,Virginia (11.1), followed. [Update] Interim Egyptian Prime Minister Essam Sharaf was being treated for exhaustion and fatigue at a Cairo hospital late Monday, but had not suffered a stroke as reported earlier, his spokesman said. The spokesman, Ahmed Saman, said doctors were giving Sharaf X-rays late Monday at Cairo's Dar Al Fouad Hospital. No details of his condition were immediately available. Sharaf has been leading a caretaker government under the military council that took power in February, when former President Hosni Mubarak resigned in the face of a popular revolt. News of his illness came the same day as a much-anticipated reshuffle of the Cabinet, with replacements announced for 14 of 27 ministers replaced. In the town of Tar Heel, North Carolina, no one has stepped up to run for mayor. In the North Carolina town of Tar Heel, residents won’t have to worry about Big Government. It’s looking like No Government. 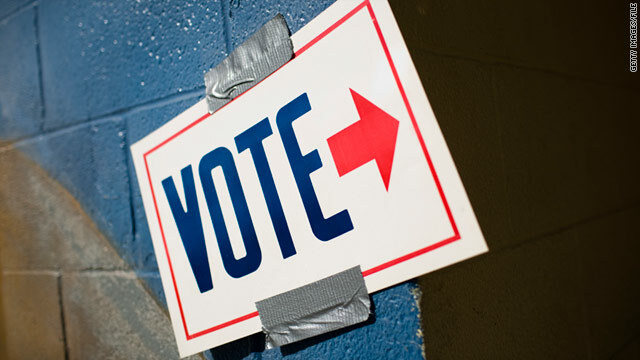 Nobody’s on the ballot for November elections, a county elections official told CNN Monday. “The town had two weeks to file and no one stepped up to the plate,” said Cynthia Shaw, director of the Bladen County board of elections. Filed under: North Carolina • Politics • U.S.
Libya says it's holding talks with U.S.
Libyan and American officials engaged in direct, face-to-face talks in Tunisia on Saturday, a spokesman for Moammar Gadhafi's embattled regime said Monday. "This is a first step. We welcome any further steps," Musa Ibrahim said in a brief interview with CNN. "We don't want to be stuck in the past." There was no immediate comment on the report from Washington. One of the first journalists to go on the record and allege phone hacking at News of the World was found dead Monday, the British Press Association said. Sean Hoare, a former News of the World employee, "was discovered at his home in Watford, Hertfordshire, after concerns were raised about his whereabouts," the press association said. "The death is being treated as 'unexplained, but not thought to be suspicious,'" the report quoted Hertfordshire police as saying. He had publicly accused the paper of phone-hacking and using "pinging" - a method of tracking someone's cell phone using technology that only police and security officials could access - according to the New York Times. Hoare was one of the few sources who allowed his name to be used when speaking to the Times last year for an investigative report about allegations of phone-hacking by the British tabloid. In his remarks, he specifically accused Andy Coulson - former editor of News of the World, who went on to become Prime Minister David Cameron's communications director - of wrongdoing. Administration and congressional officials are expected to continue working on a measure to raise the federal debt ceiling. Overheard on CNN.com: Raise the debt ceiling or starve government? 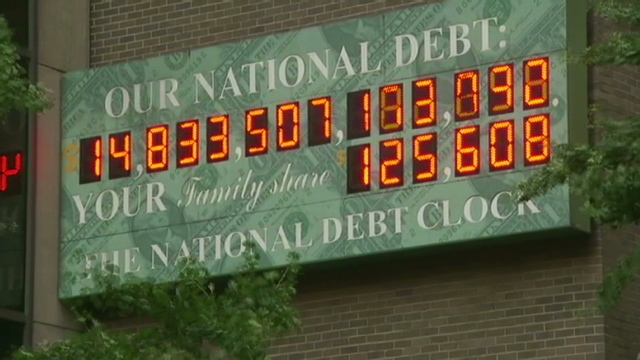 Capitol Hill leaders are scrambling this week to head off a default on U.S. debt. Gaining momentum is a version of a fallback plan designed by Senate Minority Leader Mitch McConnell, which would give President Obama the power to raise the borrowing limit but require three congressional votes on the issue before the 2012 general election. The unusual scheme would allow most Republicans and some conservative Democrats to vote against any debt ceiling hike while still allowing it to clear. The story continues to garner thousands of comments from CNN.com readers, with arguments echoing those on the Hill. Most readers support raising the ceiling and meeting U.S. debt responsibilities, while a few suggest cutting social programs to reduce government and even welcome civil war. chamber2011 said, "I'm not talking about this debt ceiling issue only, this entire issue. The sheep of the democrats keep supporting any bad move by their representatives, just like Stockholm syndrome. The business owners (who are employers remember) are trying to regain America back from freeloading tax spenders that sit in politician spots and get free money. Lets just go to war. Its about time." IanA1 said, "All Boehner has done since he got in was to rile up a bunch of uneducated reactionary maniacs on the right, and now those very maniacs have had him take our country right up to the edge of economic suicide." MeanOldMan said, "Enough of this BS. Pass the increase and get to something that really matters. Everyone knows the ceiling has to be raised and those that don't believe it haven't got the smarts to be running a lemonade stand, let alone a government. This country is falling apart and drifting into being a third world country and these guys are spending all their time arguing over whether to pay the money they have already spent." TrollWars said, "Okay, let's agree with these entitlement cutting clowns. Let's do away with social security and medicaid. Let's do away with unemployment and food stamps. So what happens to the "majority" of people making between 9 and 13 bucks an hour when they reach old age? You honestly can't expect them to save hundreds of thousands of dollars at that wage? What happens if they have a health problem that sets them back, but doesn't disable them while working. I'm guessing you want us to BEG the local church or search high and low for any doctor willing to do charitable work. drthink replied, "Let them die, if they are too lazy to save or earn real money it shouldn't be our problem, we can't expect the rich to do all the work and then also pay for everyone. The rich do all the work, the least we can do is let them keep their incentive to earn a profit." tnoutside1 said, "I never heard all this talk about killing entitlement programs when the budget was fully funded. It was GOP wars and a massive transfer of wealth (through tax breaks) into the hands of Wall Street that caused this mess. Regulation and appropriate taxation are the paths to prosperity. I thought FDR proved this when he cleaned up the GOP/Hoover mess. Or Clinton when he cleaned up the Reagan/Bush mess. People have VERY short memories. " FelixCat said, "This country will be dead in the long run for it. You simply have no clue what an immediate knee-jerk 40% cut in fed spending will do to a fragile economy. The Great Depression will be remembered as the good old days." kittykitty91 said, "I have a grand idea. Give the tea party people what they want. Make them immune to paying taxes. And in exchange we won't burden them with using roads, police, fire, schools, military protection­, DMV, etc, etc. The first time they attempt to back out of their driveway, make them pay a toll to drive on taxpayer funded roads. If their house catches fire, cough up the dough or we watch it burn. The GOP and Tea Party people are the hypocrites; they say they love this country, but all they want to do is see it burn and watch anyone suffer that does not believe in their hateful, close minded, religious agenda." rlcommenter said, "The Government is a virus that spreads and consumes. ... Why even think of giving it more money. ... It only knows how to spread and consume." SirWilk44 said, "We are dying because your liberal friends refuse to make any politically tough decisions and actually make significant cuts to the debt. 1.5 Trillion over 10 years does nothing when we are running 1.3 Trillion dollar deficit this year. I am sure your grand-kids will wonder why we did not make really tough decisions now to make their life better. " NoBSObama said, "I think it would be better if we default and declare bankruptcy. All these government programs were never viable. The government should have never got in the business of S.S.I., Medicare and welfare. It would reboot the economy back to a time were people were responsible for their own security. And without the burden of high taxes to support these programs, the average productive person could decide where to spend their own money. Goverment lied to the masses, Whats New?" At perhaps the most tense time in Sunday’s FIFA Women's World Cup final - preparations for the penalty kick shootout - TV cameras showed Japanese coach Norio Sasaki smiling and laughing with his players. Cameras focused on the U.S. women showed a different mood, with expressions of grit, focus and determination. The contrast was stark, and that wasn’t a surprise to Sasaki. "It seemed to me there was more pressure on the Americans," he said. It was a remarkable moment for Japan, a country that has had little to smile about this year, and a keen insight from the coach of a team that had not beaten the Americans in 25 games. But Sasaki’s assessment was spot-on. The "dangerous" heat wave baking the central United States is expected to extend its reach eastward in the coming week, and ultimately cover most of the eastern part of the country, the National Weather Service said Monday. "Heat index values in the triple digits are forecast across a large portion of the Midwest today, making it feel like 100 to 110 degrees or higher during the afternoon hours," the weather service said Monday morning. By midweek, the high pressure bringing the oppressive heat will expand eastward, bringing temperatures in the mid-90s to the Mid-Atlantic states "as early as Wednesday," the weather service warned. "Further out, this dome of high pressure is forecast to dominate most of the eastern and central U.S. - bringing excessive heat to much of the eastern half of the country except for the Northeast and southern Florida - through the end of next week." The British police officer who ruled two years ago that there was no reason to pursue an investigation into phone hacking by journalists resigned Monday, the second top Metropolitan Police officer to quit in less than 24 hours. Assistant Commissioner John Yates - who has since called his decision "crap" - was due to be suspended when he quit, the Metropolitan Police Authority said. The resignation came the day after Britain's top police officer, Metropolitan Police Commissioner Paul Stephenson, resigned in light of close links between the police and journalists they were supposed to be investigating. John Yates decided in 2009 not to investigate phone hacking. Authorities in Ecuador have banned alcohol sales in an emergency measure to stop apparently contaminated drinks from reaching consumers after at least 21 people died. Officials announced the 72-hour national dry law Sunday after alcohol poisoning cases were detected in several parts of the country. Hospitals treated more than 100 people who fell ill after drinking bootleg liquor over the past week, the country's government said. Investigators determined that the liquor contained methanol - an industrial-grade alcohol not intended for human consumption, Ecuador's Public Health Ministry said. The 21 patients who died all haled from Los Rios province, but similar poisoning cases have also been reported in at least four other areas, the government said. Authorities have arrested the liquor distributor and continue investigating, police said. The battle over the debt ceiling continues to fester on Capitol Hill, while concern grows of the U.S. possibly defaulting on its debt. Watch CNN.com Live for continuing coverage on this developing story. 9:24 am ET - Atlantis bids farewell to ISS - The crew of space shuttle Atlantis says goodbye to the international space station team before closing the hatch and beginning the final return home. The space shuttle Atlantis prepares to dock with the International Space Station on July 10. Hatch closed - At 9:19 a.m. ET on Monday, the hatch between the space shuttle Atlantis and the International Space Station will be closed for the final time and the shuttle will prepare for a return to Earth. Tomorrow, the shuttle will undock from the station and fly around it so visual inspections of both the space station and the shuttle's thermal protection system can be performed. 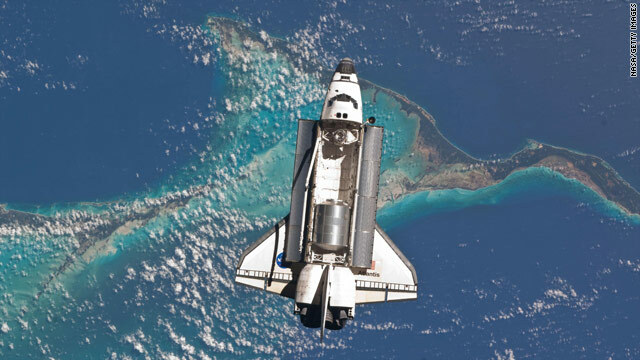 Atlantis is scheduled to land at Kennedy Space Center in Florida at 7:06 a.m. on Wednesday, bringing an end to three decades of space shuttle flight. Hot temperatures - A heat wave will continue to roast the country's midsection even as it spreads to the east, according to the National Weather Service. The hottest spots from Oklahoma through South Dakota should see highs of more than 100 degrees Fahrenheit, and top temperatures are forecast in the 90s for most of the rest of the country - with the exception of some mountain and coastal regions, according to the weather service. On Sunday, daily temperature records were broken from Alpena, Michigan, south to Miami, Florida. "Heat index values" - how hot it feels outside - have been running over 125 degrees Fahrenheit in the worst-hit areas, the National Weather Service said. The scale designed to describe how intense heat feels also includes factors such as humidity. Japan typhoon - Workers in Japan scrambled Monday to build a protective covering over a damaged nuclear reactor ahead of an approaching powerful typhoon, an energy company spokesman said. Typhoon Ma-on should strike Japan well south of the damaged No. 3 reactor at the crippled Fukushima Daiichi nuclear power plant. But the Tokyo Power Company, which is responsible for the plant wracked by the March 11 tsunami that struck northeast Japan, is constructing a "roof-like structure to prevent rain from entering holes on the turbine building," spokesman Satoshi Watanabe said. The energy company says it aims to complete construction late Monday.